Enjoy the silence that comes with the longest night and learn from the whispered wisdom it shares with you. Never fear the darkness, but find rest and respite in its stillness. Then celebrate when the light returns, brighter and stronger than before. The days lengthen again, flooding our lives with light, warmth, and life. Happy Yule and a blessed Winter Solstice to all. We stand with you to greet the new day. Thanks to everyone for showing so much excitement and interest for the return of the Solstice Dispatch Service. The elves are all a-buzz with excitement, and we're fairly certain it's not from the coffee and candy canes. You can address the letters to the Oak King or to the Holly King. However, the Solstice Dispatch Service has an excellent networking service, so if you are so moved, you can also address it to other beings and we will do our best to pass your letters along to the appropriate deity. As the days grew short and the night deepened, an uneasy stillness covered the land. The grand Grey Lady of winter had risen and walked the land once again, bringing with her the crisp silence of cold, frost, and snow. 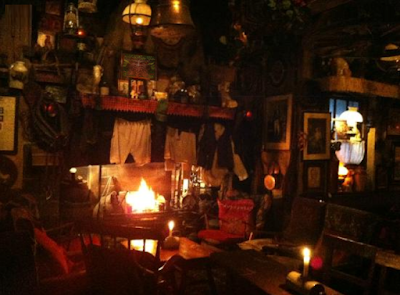 The brothers of Oak and Holly sat quietly by a crackling fire, sharing a warm bottle of cider and the sweet smell of pipe smoke lingered between them. 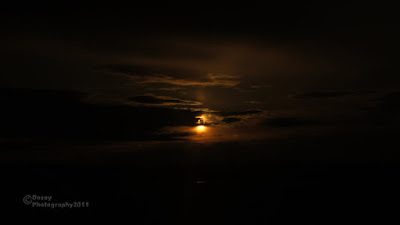 The Solstice approached, the wheel turned, and the shift in power loomed large between them. The Holly King, his cup dry once again, reached for the bottle but the tips of his fingers found the edges of a sheet of paper. Curious, he brought the letter into the firelight while pulling out his wireframe spectacles. His eyes adjusted in the dim light and he eyes smiled as he scanned the page and he chuckled lightly. "What's that?" the Oak King asked, pulled from his reverie. The Holly King removed his spectacles to lightly tap them on the page. "This letter from Laila. She was telling us about her holiday." The Oak King straightened up in his seat. "Wasn't she the artist? The postal Elves made the nicest frame for her work." He picked up a gnarled cane and gestured down the dim hallway. "Isn't it hanging just down there?" "It is." With great effort, the Holly King gripped the ancient wooden armrests of his chair, stood up, and walked away from the fire. He returned a moment later with a wooden box filled with letters. The Oak King's eyes twinkled with the light of the flames. He tossed another log onto the hearth and reached for one of the envelopes. As the evening wore on, both men shared laughter and tears, rediscovering the stories that had come to them from across the globe. Some of the authors were children, others had seen many winters, but all of them had woven the spark of youth, hope, and magic into their hand-written correspondences. Finally, the Holly King drew the last letter from the box and read it aloud for both of them to enjoy. Then a silence came between them, punctuated by the hearthfire. "Why did we stop receiving the letters?" the Oak King whispered. "I don't remember," his brother mused, stroking his beard. He was pensive for a moment, but with a smirked glance at the Oak King, he reached for the horn on his belt. He brought the weathered horn to his lip and a single note rose hearty, deep, and ancient, reverberating through the darkness around them. No sooner had the man reattached his horn to his belt, he noticed two wide eyes staring up at him. The tiny being held a pointy green hat in his two tiny hands and looked up at him inquisitive, but excited. Suddenly he was joined by another tiny person, then another, until the King could no longer see the floor before him. "Sit," growled the King and all the elves sat suddenly, almost in unison. The two Kings stared at these elves, trying to look fierce and regal, but the sight of all these hopeful elves with their multi-colored hats and bells on their feet caused them to snicker, which quickly became jolly laughter. "Is it time?" squeaked one of the elves. "It is time," rumbled the Oak King, leaning on his ancient staff. "Prepare the ink wells, pull out the good writing paper. It is time for the solstice dispatches to be sent." We officially declare that the Solstice Dispatch Service is once again active for the 2018, 2019 season. The Solstice approaches, the days will grow long again, and hope and light will return to a world hungry for it. To celebrate this long-awaited transition, we invite you to write letters to the Solstice Kings, both Holly and Oak. When we first started this project, we had the ambitious idea that we could reply to the letters during the Yuletide season. But as the few letters we received grew quickly to dozens and dozens, we were overwhelmed and could not keep up with the demand. 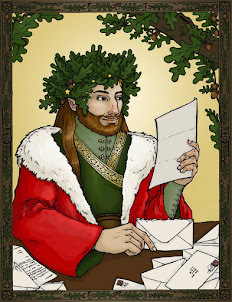 So in this new iteration, we will be making one small change: while we commit to read every letter we receive, but we cannot guarantee that we will reply to every letter by Yule. We wish to savor your letters and do not wish to be rushed in their reply, so while we do commit to reply to them, you may only receive your reply much later. Please be patient with us as we try to reply to your correspondence as quickly as we can. We are still working out the new address for the Solstice Dispatch Service, so stay tuned! Write your letters, create your beauty, place it in the envelopes, and prepare your postage. As soon as we can, we will provide you with the postal address. Don't know what we're talking about? Click here to learn more about the Solstice Dispatch Service! Happy Solstice! What are your hopes and dreams for the coming Solstice? Is there anything you would like to say to the Kings of the Solstices?